Anne Willan demystified classic French culinary technique for regular people who love food. Her legendary La Varenne Cooking School - in its original location in Paris and later in Burgundy - trained chefs, food writers and home cooks. Under Willan's cheerful, no-nonsense instruction, anyone could learn to truss a chicken, make a bernaise, or loft a souffle. 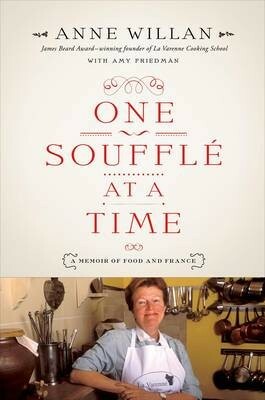 In One Souffle at a Time, Willan tells her story and that of the food-world greats - including Julia Child, James Beard, Simone Beck, Craig Claiborne, Richard Olney - who changed how the world eats and who made cooking fun. She writes about how a sturdy English girl from Yorkshire made it not only to the stove, but to France, where she overcame the closed male world of French cuisine to found and run her school. Willan's story is warm and rich, funny and fragrant with the smells of the country cooking of France. It's also full of the creative culinary ferment of the 1970s-a decade when herbs came back to life and freshness took over, when the seeds of our modern day obsession with food and ingredients were sown. Tens of thousands of students have learned from Willan, not just at La Varenne, but through her large, ambitious Look & Cook book series and twenty-six-part PBS program. Now One Souffle at a Time - which features fifty of her favourite recipes, from Moroccan Spiced Turkey to Chocolate Snowball - brings Willan's own story of her life to the centre of the banquet table.